HONG KONG—A survey conducted by Hong Kong Baptist University reveals that 64 percent of Hong Kong residents interviewed are in favor of direct elections for the functional constituency seats 1 of the territory's Legislative Council by the year of 2012. The survey was entrusted by a group headed by the former Chief Secretary for Administration, Mrs. Anson Chan. Conducted in late April, the survey interviewed 900 people. The statistics show the general public in Hong Kong strongly support making changes to the Legislative Council starting from 2008 with ultimate goals to implement direct elections for the chief executive of the Hong Kong Special Administrative Region (HKSAR) and all of the members of the Legislative Council. In addition, 56 percent of the interviewees support expanding the scope of corporate ballots for the functional constituency seats in the upcoming Legislative Council's election in 2008 so that board of directors and company executives have the right to vote. Forty-five percent of the interviewed people also indicate they favor the reconstruction of the 30 functional constituency seats down to 10. Eventually, all of the seats in the Legislative Council will be filled through direct elections. According to the survey, 69 percent of the interviewees are aware that Donald Tsang, the incumbent Chief Executive of HKSAR, has promised to establish the roadmap and timetable of universal suffrage before his term completes in 2012. About 68 percent also consider direct elections for the chief executive is beneficial in ensuring the justice of government's policy. 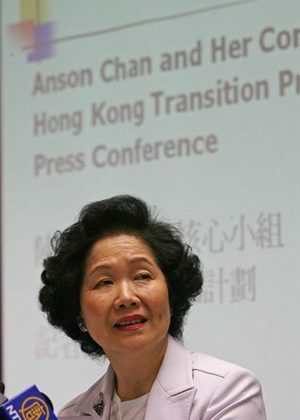 Mrs. Anson Chan's group, known as “Core Group”, was established immediately after her announcement on Sep. 23, 2006 that she would not participate in the 2007 campaign of the chief executive. The “Core Group” conducts studies on the reform of Hong Kong's political system and promotes general public's rational, all-party discussions over political and constitutional reforms, hoping to improve the administration and policy execution of the HKSAR's government. Note:  Among the existing 60 members of Hong Kong's Legislative Council, 30 are elected by geographical constituencies through direct elections, and the remaining 30 members by functional constituencies.